Maryland is currently one of only two states that assess a separate inheritance tax and a separate estate tax. The other state that collects both state inheritance taxes and estate taxes in New Jersey, while four other states also collect a state inheritance tax, Iowa, Kentucky, Nebraska, and Pennsylvania. A few years back, Indiana retroactively repealed its state inheritance back to January 1, 2013. An estate tax is charged against the entire estate regardless of who the beneficiaries of the estate may be. An inheritance tax is only charged against the shares of certain beneficiaries of an estate. The Maryland inheritance tax is imposed on the clear value of a property that passes from a decedent to only certain beneficiaries as identified below. The Maryland inheritance tax is assessed against property that passes under a will, Maryland intestacy laws, and property that passes under the terms of a trust, by a deed, by joint ownership, by payable on death designation, or otherwise. In addition, a property that is given away "in contemplation of death" is subject to the Maryland inheritance tax, and if a "material part" of a decedent's property is given away within two years of the decedent's death, the gifted property will be subject to the tax. Effective for decedents who die on or after July 1, 2000, property passing to a child or other lineal descendant, spouse of a child or other lineal descendant, spouse, parent, grandparent, stepchild or stepparent, siblings, or a corporation having only certain of these persons as stockholders, is completely exempt from the Maryland inheritance tax. Effective for decedents who die on or after July 1, 2009, a primary residence that is owned by domestic partners held in joint tenancy at the time of one partner’s death is exempt from the Maryland inheritance tax. 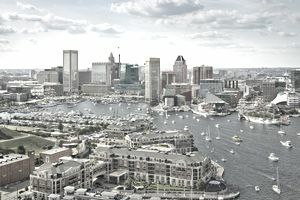 Property passing to any other type of beneficiary, including property passing to a domestic partner other than a jointly owned primary residence, is subject to the Maryland inheritance tax. Only life insurance that is payable to the decedent's estate is included in the value of the Maryland estate. The current Maryland inheritance tax rate is 10%. The Maryland inheritance tax is collected by the Register of Wills located in the county where the decedent either lived or owned property at the time of death. Each Register of Wills is responsible for calculating the inheritance tax due based on the estate inventory and then the personal representative is notified of the amount owed. The personal representative must then pay the Maryland inheritance tax before distributing the property to the heirs, otherwise, each individual heir is responsible for paying his or her portion of the inheritance tax due. If a formal probate court proceeding is not required, the Register of Wills located in the county where the decedent lived or owned property will send a bill to each heir responsible for paying the inheritance tax. For more information about Maryland inheritance taxes, contact the Register of Wills in the county where the deceased person lived or owned property at the time of death. NOTE: State laws change frequently and the following information may not reflect recent changes in the laws. For current tax or legal advice, please consult with an accountant or an attorney since the information contained in this article is not to be relied on as tax or legal advice and is not a substitute for tax or legal advice.